Humane Ranch of Texas (Houston area) - The Humane Ranch of Texas was established in 1979 by the late George Huebner to help abused and neglected horses and other animals. Several years ago in 2005 The Humane Ranch of Texas CLOSED. *This listing remains in memory of George Huebner and all he did to help horses. If interested in FOSTERING or ADOPTING a Horse OR farm animal, (occasionally HSPCA have more hoofed animals than they have room for and then will need foster homes) contact the Houston SPCA.E-Mail. NOTE: They sometimes have other animals such as donkeys, goats, pigs and other animals such as ducks that also need a foster home. NOTE: See MANY other horses that need a home on the list shown further down this page. 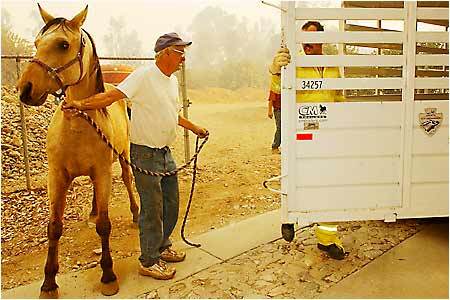 Most horse rescue groups need the following items for helping horses. HOUSTON area - HoustonHumaneSociety - (713)-433-6421, ext. 396 - Ask for Cruelty Investigations or E-Mail. Make CERTAIN to include the following information: Your Name, Telephone numbers, nature of complaint, Street address where the abuse is occurring. If possible send a photo. North Texas (Dallas area): If you live in the Central or North Texas and would like to FOSTER or ADOPT horses in those areas, E-mail - AustinDallas areas. NOTE: If you do NOT receive a reply in 4 days, write again and put '2nd Request' on the Subject line of your e-mail. Carriage Horses ....Carriage rides are NOT romantic if you are the horse! Carriage Horses.... The Truth about being a Carriage Horse. Carriage Horse accident. Hit by a vehicle. Carriage rides are NOT romantic if you are the horse. Adopt a Horse and SAVE a Life! but ONLY a few who help animals! .... The animals need you! Help SAVE Animals in a Disaster! .... Be a Volunteer! Probably the most prescribed drug for women in the United States is made from pregnant's horse mare's urine. while their urine is collected to product this pill !!!! with their legs stretched out for fear the collection cups will become detached as the urine is "harvested." Many of these mares get little or no exercise for the consecutive months they are forced to stand in the barns. The story is just as tragic for the foals who most be disposed of in some way. phone number as well a phone number for an 'after hours' Emergency Vet Hospital in your area. Live in the Seattle area(Pacific Northwest area)?